Diagram of test. Copyright Cambridge University Engineering Department. 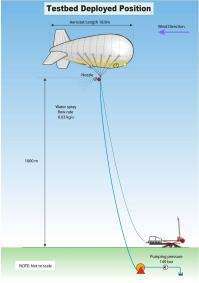 (PhysOrg.com) -- Last month it was announced that a group of researchers had come together to start a geoengineering project called Stratospheric Particle Injection for Climate Engineering (SPICE). Its aim was, and still is, is to find out if it would be possible to simulate the planet-wide cooling effects of volcanoes by sending a giant balloon up into the stratosphere so as to pump aerosols (via a very long hose) into the atmosphere that would reflect back some of the suns heat, thus cooling the planet slightly; this to offset the global warming that has resulted from the constant pumping of carbon emissions into the air. The team had originally planned to test a much smaller version of their balloon/hose experiment this month spraying only water at a lower altitude. Now however, the group has bowed to criticism from various sectors and has postponed the initial test until sometime in April. The project, sponsored by several United Kingdom research councils (meaning government money) most prominently the Engineering and Physical Sciences Research Council (EPSRC) though lauded by some, has also been deemed a waste of money. Others thought it a bit premature for one small group of people to choose to undertake a project that could impact people the world over without so much as please or thank you. In the end though, it was the sponsors that wound up putting a hold on the project. Dr Matt Watson of Bristol University, the team lead for the project, has told the BBC that he endorses the decision to put off testing the project until all voices have been heard, but freely admits to being surprised by all the criticism. He insists the project is simply to test the viability of the concept, and no one in the group has ever proposed going ahead with the full scale project without approval of some governing body. Whats missing in the current news cycle though is information on whether the group has been conducting ground based testing of the concept or whether construction of the test balloon and/or giant hose has begun; and if so, how that testing has gone. Also apparently missing from the debate thus far are voices pointing out that as of yet, no other real workable alternatives for solving the problem of global warming have been offered, which to some might mean that emergency projects such as this one should be undertaken whether critics agree with the plan or not. After all, this one isnt like the debate about stem cell research or cloning food. While all of them may have moral or ethical underpinnings, only one of them might one day be used as stop-gap measure to ensure our very survival. The whole point of the experiment is after all, to find out if it would work, not put it into action. Or in other words, to add to our knowledge bank in case we fail to find other means to prevent further global warming and wind up needing to take drastic action at some point. Looked at that way, it seems foolish to not allow projects to proceed, even if some of them seem rather harebrained. What impact would sun dimming have on Earth's weather? bury a gigaton worth of tnt , spread through 1000 nukes (1 mega tons each) buried beneath the ice in antarctica each buried along existing ice fault/crack/crevasse lines that have already been mapped in and under the sheet , and set them off in a controlled wave like pattern of charges starting with the outer parts of the ice rivers toward the center (farther inland) with the center placed at the center of the ross ice shelf. i think it would be an interesting geoforming experiment. I'm beginning to think that anyone who hasn't passed calculus by age 18 should be shot. Or at least not be allowed to vote, or take part in political demonstrations. Yeah, I know, a bit drastic--but then you see a story like this one. The purpose of the test was not to affect the climate in any way, but to develop the technology for pumping liquids to high levels. My guess is that they would end up with an arrangement where pumps were located every hundred meters or so, instead of one (very high pressure) pump on the ground. The savings in hose weight would more than make up for the weight of the pumps, and the amount of energy used should be about the same. You want to blow up antarctica? I'm sensing a little pent up rage against penguins... bad childhood experience? Or are you just suggesting a preemptive strike against The Thing? Exactly right. The AGW/Climate change agenda is a basket-case of progressive causes masquerading as solutions. There will never be a debate over a solution much less the problem, until both the left and the right actually believe and fear the consequences of global warming.